A joint venture between the UK's Shell and Malaysia's Petronas oil companies has won the right to develop Iraq's giant Majnoon oil field. A total of 44 companies took part in a bid for 10 fields in the second such auction since the invasion in 2003. Shell and Petronas beat a rival bid from France's Total and China's CNPC. Although Majnoon is a huge oil field, with reserves of 13 billion barrels of oil, it currently produces just 46,000 barrels per day. 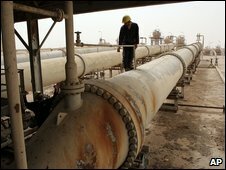 Iraq is an attractive, but difficult prospect for the international oil industry. The reserves are vast, much of it is relatively cheap to extract and foreign contractors are welcomed by the Iraqi government. But there are serious drawbacks for foreign contractors, most obviously the security situation. Iraqi politics and an uncertain legal environment are also complications, creating doubts about the soundness of oil contracts. Iraqi officials are keen to get the best financial terms they can so it has been difficult to do deals. Now, the lure of a long term and possibly very profitable opportunity has brought the oil companies back. Some agreements have now been made and there could be more on Saturday. But there have been no bids for some individual oilfields, a sign of the persistent difficulties that plague Iraq's oil industry. Shell and Petronas have pledged to increase that output to 1.8 million barrels per day. Their venture, which includes a 20-year service contract, will receive a fee of $1.39 a barrel. In June this year, a winning bid to develop an Iraq oil field received $2 a barrel. Also on Friday, a consortium led by China's CNPC was awarded the contract for Iraq's Halfaya oil field. The consortium also includes Malaysia's Petronas and France's Total. It requested fees of $1.40 a barrel of oil extracted from the field, and projected output would reach 535,000 barrels per day. Halfaya, in southern Iraq near the border with Iran, is a much smaller field with reserves of 4.1 billion barrels of oil. Two of the fields on offer at the auction, East Baghdad and the Eastern Fields, failed to attract any bids. Iraq's known reserves of conventional oil rank behind only Saudi Arabia and Iran. Its daily output is relatively small - about 2.4 million barrels - but it aims to triple that over the next few years. It needs the expertise of foreign companies to reach that goal of reviving its oil industry, which has been battered by years of war and sanctions. As much of its oil is relatively cheap to extract, analysts suggest the potential profits for foreign companies could be huge. "This is an opportunity without precedent anywhere else in the world. The scale of reserves available for development and exploitation is without equal," Peter Kemp from Energy Intelligence told BBC News. "That is something that no oil company... can ignore." But as BBC World Service's economics correspondent Andrew Walker points out, there are serious drawbacks for foreign contractors, most obviously the issue of security. "Iraqi politics and an uncertain legal environment are also complications, creating doubts about the soundness of some oil contracts," he says.